I have calculated the concurrency numbers through July 2009 provided by the CensusPlus UI Addon. The numbers are fairly unsurprising for the past couple of months. 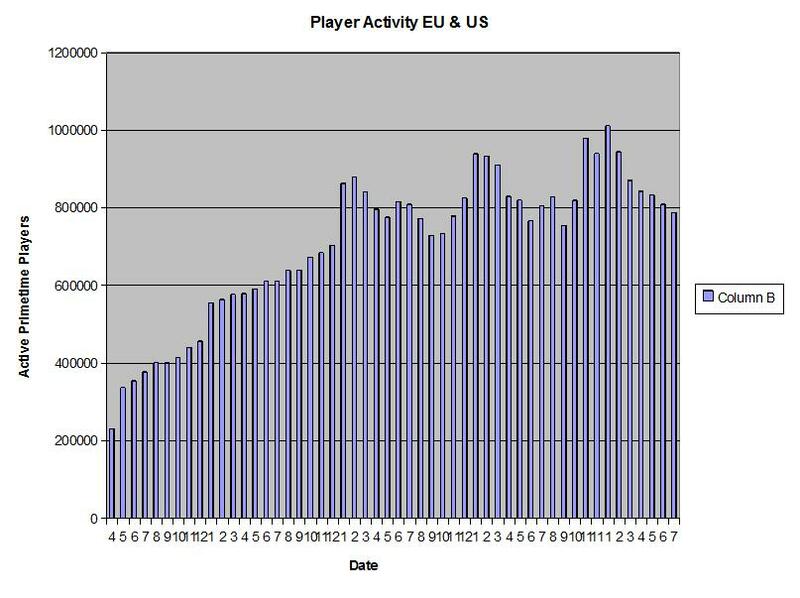 We continue to see a decline in player activity, which is to be expected until the next major content patch, at which point we should see at least a small uptick before resuming a gradual decline. And of course, just by submitting, you can win great prizes such as Amazon gift certificates! It's easy to do, it helps the site and it can be profitable to you! So help by submitting data today! Does this get updated anymore? I doing my last submission after I write this, and then I am done. I see no point in helping the project if the project it self is dying. I again ask that Rollie bring more people in on this project to help him and bring it back to life. It is slowly dieing, and by that I know people are still submitting, but as the project is ignored, I see more and more people moving away from it (and new people like I am replying to) will stop joining. Sorry to hear that, Epik. It is not as easy as you think to just 'add' someone to the project. Ceto at one time was able to help me out, and that's someone I trust very much and even then it was pretty hard to work it out so he could help make changes. [quote:90f3b373cd="Rollie"]Sorry to hear that, Epik. I really appreciate the responses and the time you have put into the addon. I imagine its no small task running a large site like this as well as the addon itself. Depending on what you need, I could help out. [quote:aa794bf7e7="Rollie"]Sorry to hear that, Epik. Well once again I offer my services to you and what ever I can do to help. I offer my services free of charge (if you want to kick things down to me once in a while I wouldn't complain, but I am willing to help for free). We need a way to talk outside of these forums to discuss this more. Send me a PM with a way please. You can email me, rollie (at) warcraftrelams.com and we can talk outside the forums.